It's that time of year again. E3 2010 opens it's floors to the gaming world tomorrow, and along with it begins Warner Bros's marketing push for their newly announced Mortal Kombat game. Part of the marketing push includes giant banners thrown all across the LA Convention center showing silhouettes of various fighting poses & fatalities. 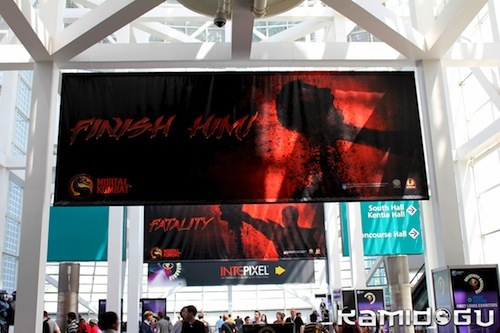 One banner says FINISH HIM, and another says FATALITY! Take a look at a one of them courtesy of Bitmob on Flickr. 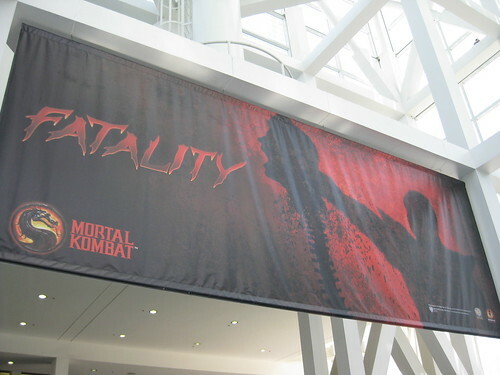 There is also planned a massively detailed Mortal Kombat (2011) booth in the Warner Bros. area of the floor. 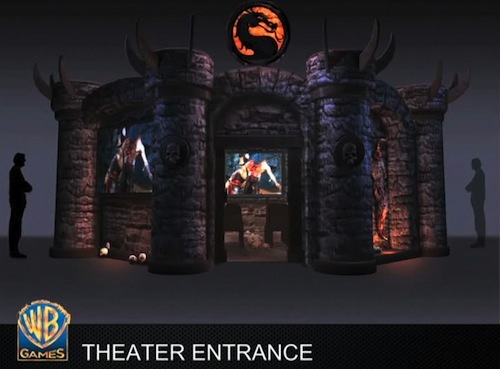 Fansite Total Mortal Kombat found a concept render of their booth Theatre over the weekend in the most recent GameTrailers TV episode. It looks like a massive theatre that will be set up to watch video footage and/or demos from Mortal Kombat on the show floor. It's hard to tell how big it really is, but until tomorrow it'll have to do. We don't currently know if the game will be playable to the public at E3, but we'll find out tomorrow when the floor opens to the public. Sadly life interfered and no one from TRMK could schedule a trip to E3 this year, so instead we've teamed up with fellow fansite Kamidogu who will be at E3 2010 tomorrow to bring fans news of Mortal Kombat (2011) directly from the show floor. So check back for updates as the day goes on. Update 10:00pm CST: Kamidogu updated earlier tonight with some awesome pictures of the LA Convention Center. Included in those is a awesome look at the two Mortal Kombat banners back to back. Oh yes!!! I want to see more fatalities from other characters such as Mileena. Also, speaking of Mileena, I want to hear her scream again like she did in MKD-MKA. More characters from the roster should be revealed too. No I'm just an idiot, all fixed now. http://twitpic.com/1wuh8p This is a real picture of the booth by one of the MK team members. Yeah I saw that, I'll post up a better one from him tomorrow. They are doing a hell of a job with promotion. Booth looks very sweet. Hope they show more than the teaser trailer. MK was shown during Sony's 3D montage. Kung Lao's fatality to be precise in 3D. Oh yeah, I'm watching E3 in G4 right now while doing something else and I've noticed Kung Lao's fatality. He did it on Reptile. First, Kung Lao throws the hat at Reptile, decapitating him. Then he slices him in half. That is just so AWESOME!!! That clip was part of the Sony 3D montage that the person above me is talking about.